It's spring! It's winter! It's winterspring! Whatever it is, it's ice cream stand season again. A few stands are already open, and more will be opening in the next few weeks. Here's our annual rundown of a bunch of seasonal ice cream stands, with opening dates. In some cases the dates are TBA, or we just couldn't find out (yet). So if you can fill in some of the information in the comments, we'd much appreciate it. The Ice Cream Man in Greenwich: The Ice Cream Man is open more or less year round, but was on winter break until March 3, and currently open Friday and Saturday noon-7 pm and Sunday noon-6 pm! Jim's Tastee Freez in Bethlehem: Opened March 5! Snowman in Troy: Opened March 5! Bumpy's Polar Freeze in Schenectady: Opened March 6! Guptill's Coney Express Ice Cream in Latham: Scheduled to open March 11! 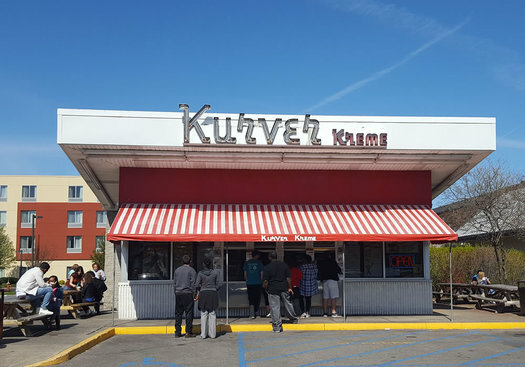 Kurver Kreme in Colonie: Scheduled to open March 15! Twist in Glenmont: Scheduled to open March 17! The Dairy Haus in Saratoga Springs: Scheduled to open March 18! Martha's Dandee Creme in Lake George: Scheduled to open March 18! Pirate's Hide Out in Halfmoon: Looking to open March 24! Country Drive-in in Clifton Park: Scheduled to open March 29! Jumpin' Jack's in Scotia: Scheduled to open March 30! Farmer's Daughter's Drive In in Saratoga: Scheduled to open March 31! Mac's Drive-In in Watervliet: Scheduled to open in April! Scoups Homemade Ice Cream in Colonie: Scheduled to open in April! Ross' Ice Cream Stand in Slingerlands: We don't know, yet! Moxie's in Wynantskill: Usually opens around Mother's Day in May. Got another place to add? Please share it in the comments. And of course, year-round places -- such as Emack & Bolio's in Albany -- are also open. Because, you know, they're year round. I was in line at Snowman for half an hour on Sunday. So worth it! Cappies in Amsterdam makes their own ice cream, and opens March 15 as well. Any word on Curry Freeze?